I'll give you the bad news first, so I can finish on a positive note. Here we go! 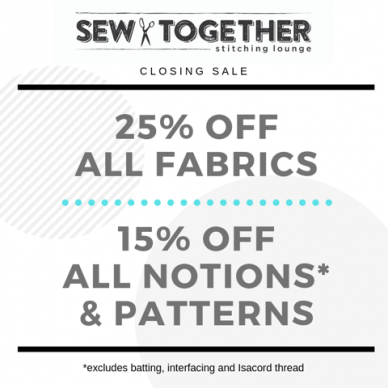 The bad news is, with sadness, and gratitude, I am letting you all know that Sew Together Stitching Lounge is closing its door as a retail shop on June 2nd, 2019. Thank you all for being the most welcoming, warm and kind community I have ever had the privilege to work with. The good news is that the longarm studio and teaching space will continue in this location through the summer. If you have quilts that need to be quilted, please take advantage of our services. If you're enrolled in classes, they will continue as scheduled unless you've already been contacted. Private classes and Studio time are also available, and appointments are very welcome as we transition. I'm looking for a more intimate space in the area, and weighing some options. I'll be in touch with more about this in the next few weeks. ...and, for even "gooder" news! LET THE SALE BEGIN, YIPPEE!!! The sale will be in-store-only this weekend for our brick and mortar community. Please come by, say 'Hi' and shop early for the best selection. The sale goes on-line Monday with the code, CLOSING25.